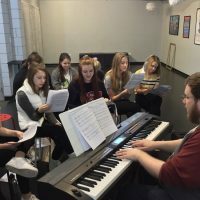 GIRLHOOD and GRACE updates… – CPA Theatricals, Inc.
GIRLHOOD is a musical we are developing for middle and high schools. Its focus is on girls becoming women. The show focuses on four characters from when they first start middle school (about age 12) to when they graduate high school (about age 17). We see friends made, friends break up, and maybe make up again. We see how some girls deal with the stress of their teenage years. The show is being composed by 14 different composing teams from around the US. With hip hop, folk, contemporary and Broadway style songs, the music is the hit of the show. We now have completed the storyline and the character profiles. We have completed workshopping some of the songs for the show, using middle school actors, to make sure the music is in a suitable key, among other things. You can see those videos HERE. But what about transitions, character development and well…does the show flow, does it make sense. And more important, do we care about the characters, does each of the four principal characters have an arc? So, even though the show is designed for teenage girls and boys, we will have a full reading of GIRLHOOD using professional adult actresses. They will sing the songs, help develop the characters and read the dialogue for the creative team. This is a private table read for the creative team only – sorry…..no public yet. But, here is the fun part – our creative team consists of the director, musical director and producers of course. But sitting in that room giving us feedback will also be a middle school theatre director and well….4 girls! GRACE & THE ISLAND OF MISFITS is a Christmas musical that we have been developing for over a year. We now have a full first draft of a script. Now is the time where we need revisions. So, I have sent the script to several theatre colleagues of mine, all seasoned professionals with decades of experience. I have refined, clarified and simplified the story. We are heightening the drama and making sure each of our female leads has dialogue that makes sense and fits their character. With this show, too, we are just about ready for a FULL reading. In this case it will be a full reading with an audience. We want to “test” many things. We will gauge audience reaction – do they laugh or not laugh at certain jokes. And, we will solicit feedback by asking “What are the two weakest moments in the show?” “What was confusing to you?”, etc. Then…more revisions.